I’ve been reading Dr. Bob Rotella’s new book, The Unstoppable Golfer, (written with Bob Cullen). His basic thesis is that to play your best golf you need to develop repeatable sensible pre-shot routines, establish targets for all your shots and then go as “unconscious” as you can while hitting the shot or putting. While this approach is important for all shots, Rotella believes it is especially important for the short game. Rotella assumes that the reader can play, but is being stopped from improvement by a weak mental game that shows up more frequently from 100 yards in. 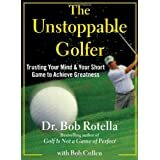 By following Rotella’s mental prescriptions readers will become “unstoppable” on the golf course. The book is easy to read and his mental game approach is well accepted among professionals. If you are looking for help with your short game and know the basics of chipping, pitching and putting, this book will help. In the book Rotella rightly points out that sports psychology is a relatively new profession. However, he may not have come across what is likely the first reference to the mental game which appeared in a poem written by an Edinburgh medical student in 1687! The 12 line poem appears in Thomas Kincaid’s diary and is the first poem entirely about golf. The mental game reference is in lines 11 and 12. These last two lines suggest that if you hit a bad shot, put it out of your mind when preparing to hit the next. Still good advice. In my book, Golf Course of Rhymes – Links between Golf and Poetry Through the Ages, I include a poem that I wrote which sums up the challenge of following the prescriptions in Dr. Rotella’s tome. It’s darn hard to do! But in spite of the challenge, Dr. Rotella’s book may help. Check it out on Amazon. Oh, and you can check out mine as well. Thanks. Filed Under: golf, golf poetry, golf poetry books, humor, Mental game, poetry, The book "Golf Course of Rhymes" Tagged With: golf, golf history, golf humor, golf instruction, golf poetry, Mental game, poetry, rhymes, sports poetry, The book "Golf Course of Rhymes"